Groom is looking forward to relocating his store at The Summit. Building all the fixtures himself, “It is going to have that gray, reclaimed wood aesthetic. Bright, inviting and cleaner,” he said. Journal photo by Jordan Wald. 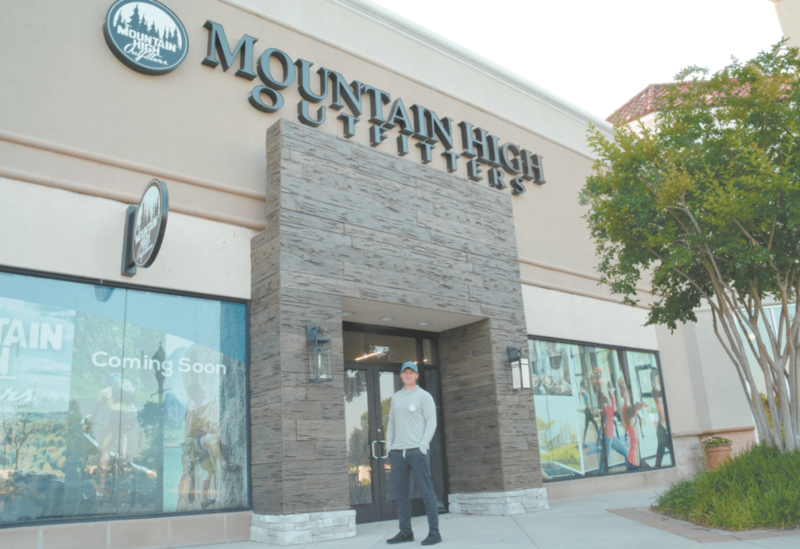 Christopher Groom, founder of Mountain High Outfitters, is busy preparing a new space in a more prominent location at The Summit for his popular outdoor store. Groom is moving from his current storefront near Saks Fifth Avenue to the high side of The Summit shopping center. “After many years tucked in the corner, we are able to move up toward Urban Outfitters. It will be more visible and accessible,” Groom said. Groom opened the first Birmingham location in 1999, and since then the business has grown to more than a dozen locations in five cities, including Atlanta and Nashville. But Mountain High Outfitters wasn’t the University of Alabama grad’s first foray into the Birmingham business community. Groom started his entrepreneurial work years ago, when he ran the first Jamba Juice in the city. He said his aptitude for business began as he overcame challenges he faced running the smoothie joint. Groom describes himself as someone who is passionate about fitness, wellness and the out- doors. Right now, he particularly enjoys paddle-boarding on Lake Martin or at Oak Mountain Park. His enthusiasm for the outdoors, his knowledge of multiple fitness industries and his years of experience have him always looking to grow his business. “When I decided to get into Atlanta, I found an area similar to Mountain Brook, and we are getting a good response similar to here,” Groom said. Mountain High Outfitters is a frequent sponsor of Over the Mountain area events such as charity fun runs, but the store’s community involvement is growing beyond its Summit, Cahaba Village in Mountain Brook, Shops of Grand River and Riverchase Galleria in Hoover locations. A location in the up-and-coming area of Avondale is widening Mountain High Outfitters’ exposure to more areas of town. While Groom has been working on new locations for the past several years, that doesn’t mean he doesn’t pay close attention to each one to ensure its success. In his new location, Groom is giving the store a fresh look. “I’m building all the fixtures myself. It is going to have that gray, reclaimed wood aesthetic. Bright, inviting and cleaner,” he said. Groom said he’ll have the store open for business as soon as possible, but he is busy putting on the finishing touches.